The first Archos tablet is available now for £ 199.99 incl. taxes in the UK. The French tablet maker has launched their first tablet and comes with Android 3.2 Honeycomb. Additionally the tablet is now available for pre-order in the US for $299. That is the 8GB version with WiFi which is an 8 inch tablet. 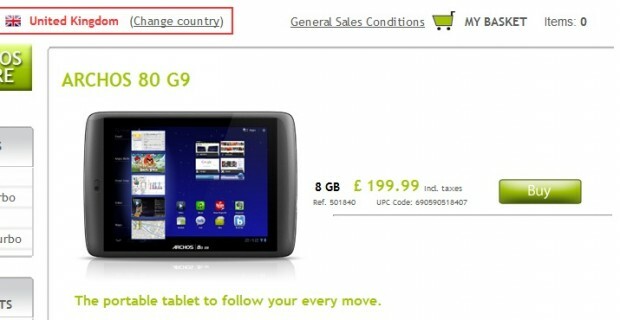 You can purchase the Archos 80 G9 in the US by clicking on this link. Archos will be launching three different versions. The Archos 80 G9 comes in 16GB Wi-Fi and 250GB HDD WiFi versions. With the 16GB version you will also get a faster processor. The 8GB version comes with a 1GHz dual-core processor but the 16GB version brings you a 1.2GHz dual-core processor. The top features of the 8GB Archos 80 G9 are that it will feature 512MB RAM and feature a resolution of 1024 X 768. You will get Google’s Mobile apps Suite with Android Market on this Android Honeycomb 3.2 tablet. You will get the standard WiFi, micro SD Slot and a 720p camera.